The ESA/NASA Automated Transfer Vehicle - 1 "Jules Verne" Reentry Observing Campaign. 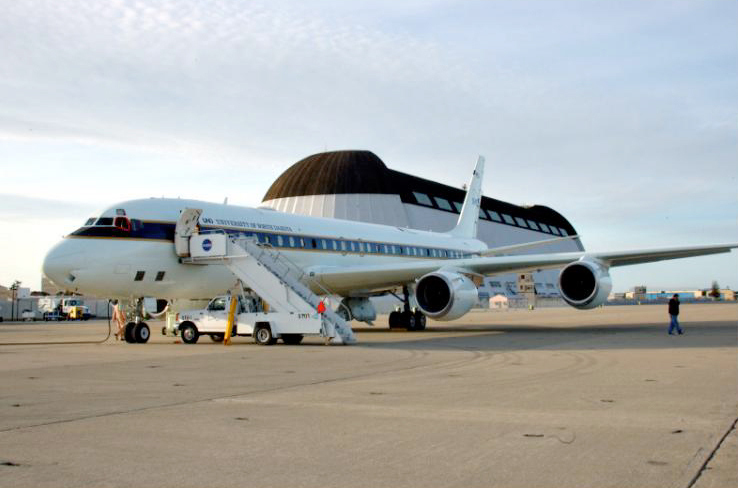 The Gulfstream V aircraft used in the ATV-1 "Jules Verne" MAC mission is operated by the aircraft holding company "H211 LLC" from locations at NASA Ames Research Center and elsewhere. The same aircraft was used in the successful September 1, 2007, Aurigid MAC and the January 3, 2008, Quadrantid MAC missions. Several of the same cameras will be deployed again. Instrument setup : This is a normal business jet, with a typical layout of chairs, tables, and couches. The aircraft has five large 22 x 15 inch windows, made from a number of acrylic panes. The window spectral transmission curve is shown to the right. Light longward from 380 nm, out to about 2.2 micron, is transmitted. The instruments are mounted on top of camera tripod heads, which are fixed to acrylic camera stands. Each stand rests on the existing chairs and couches in the aircaft. For pictures of the instrument setup, we refer to the Aurigid and Quadrantid MAC websites. All instruments and stands are stored for takeoff and landing. 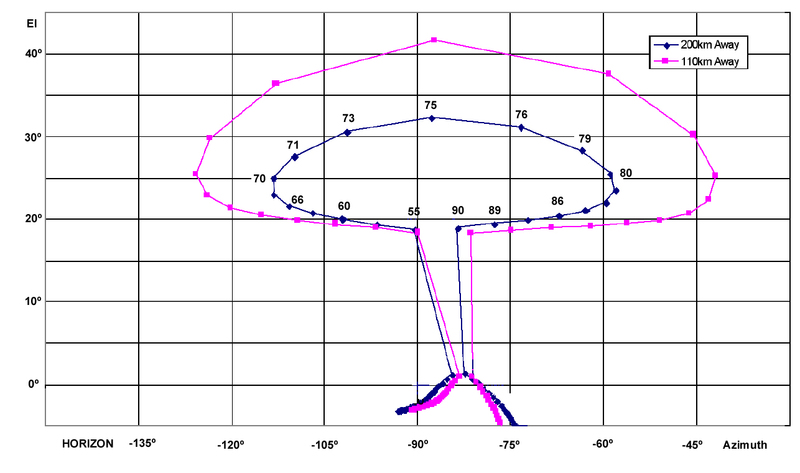 Flight path: The Gulfstream V will be positioned along the 75-km altitude point along the entry trajectory. After approaching the staging area, the aircraft will turn to fly parallel to the approach trajectory, at a safe distance of 200 km. Just before entry, the aircraft will make a right-hand turn and fly in an azimuth direction so that the observers (located on the left-hand side of the aircraft) will have a clear view of the approaching ATV, in forward direction (and unobstructed by) the aircraft wing. 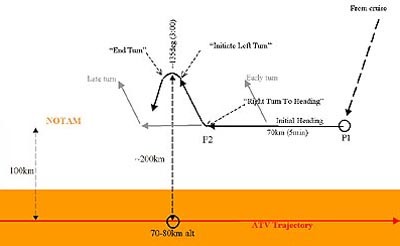 Subsequently, the aircraft will make a 135-degree turn, timed so that ATV is nearest the aircraft at the peak of the turn. 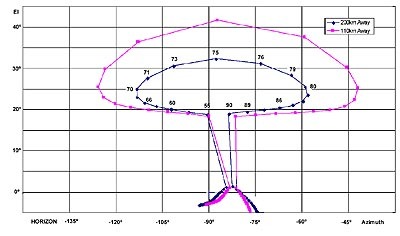 This will make it possible to follow the spacecraft on its reentry path further down range for stereoscopic measurements with the B757 aircraft. This graph was constructed by Jim Albers. Click on picture for better view. 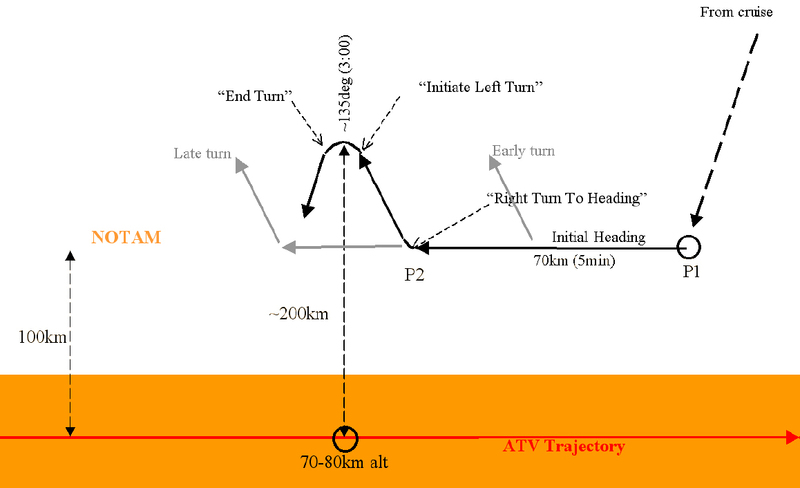 The turn causes ATV to move higher in the field of view. The graph to the right shows how the direction towards ATV changes during the turn. 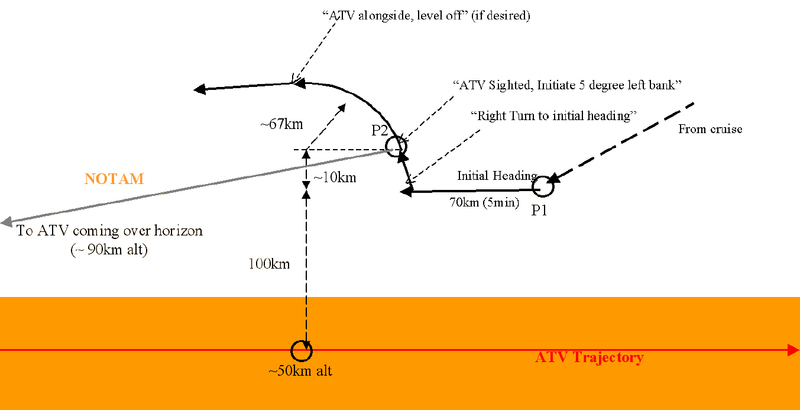 Two trajectories are shown, for a distance of 200 (= nominal flight path) and 100 km from the ATV entry trajectory. Calculations by Jim Albers. Total number of researchers: 10. Jim Albers of San Jose, with Lockheed Martin, will oversee the navigation of the Gulfstream V.
STATION 1 (same location as during prior observing campaigns): ATV reentry observing campaign mission manager Dr. Jason Hatton of ESA/ESTEC will use a telescopic imager for high spatial and high temporal resolution imaging of the reentry, high resolution imaging of selected fragments at close range, and study fragmentation events and spin rate. 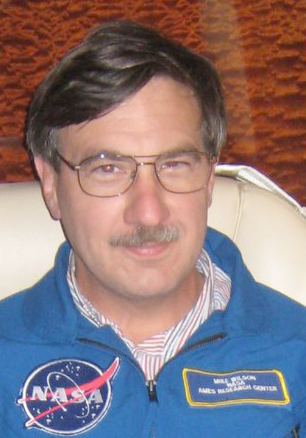 Hatton is a veteran of past Genesis SRC entry observing campaign and recent meteor shower Gulfstream V missions. 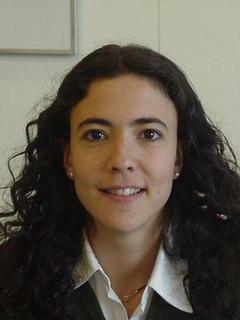 Hatton will be assisted by Dorothee Aubry of the Universitaet Freiburg, Germany. 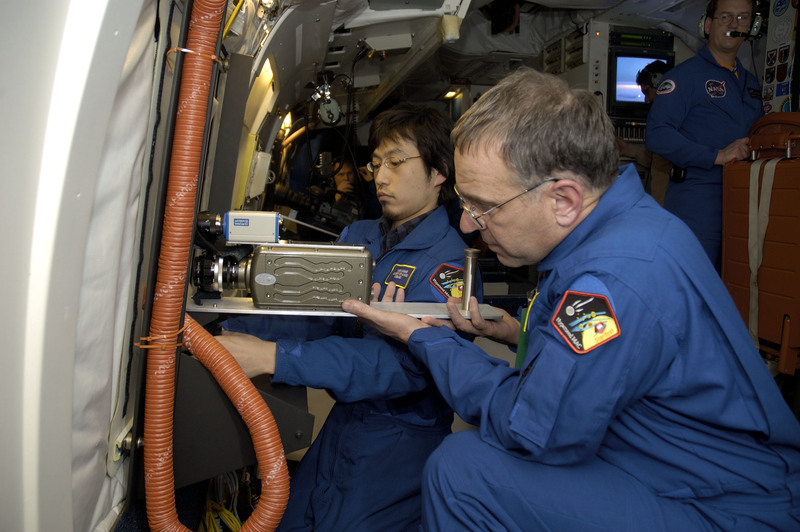 At the same station, the ESA SPOSH camera will be mounted, equipped with a transmission grating, for staring wide-angle still images and low-resolution spectra. A 120-degree f1.2 lens projects the sky on a 1000 x1000 pixel CCD. 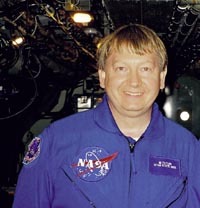 STATION 2 (double-seat): Paul Maley, NASA JSC, head of the Central America Reentry Observers Network CARON, is an expert in reentry imaging, and will lead a team to observe the reentry with two intensified cameras in a manner similar to past observations. These sensitive imaging cameras will be pointed at the entry vehicle. These observations are coordinated with the NASA/JSC Orbital Debris Office. Maley himself is elsewhere committed at the time. The cameras will be operated by the lead for optical measurements, Edwin S. Barker, of the JSC Orbital Debris Program Office (shown in photograph). 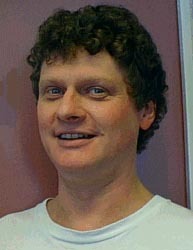 STATION 3 (double-seat): Professor Hans Stenbaek-Nielsen, a Danish national at the University of Alaska at Fairbanks and a veteran of past observing campaigns, will deploy a Phantom 7.3 high framerate imager for imaging and low-resolution optical spectroscopy (400 - 800 nm) at 500-1000 frames/s. 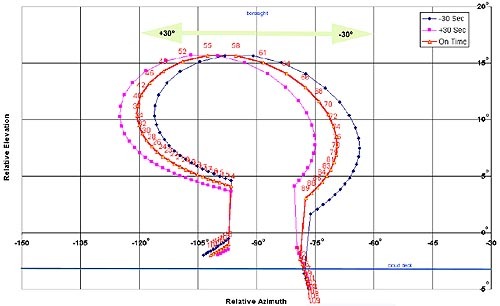 This work is multi-station with observations from the B757 (McHarg). Nielsen will be assisted by Takeshi Kammae from the University of Alaska at Fairbanks, a veteran of the past Stardust observing campaign. At the same station, Jim Albers of San Jose, with Lockheed Martin, will operate a wide angle (30 x 50 degree) staring intensified camera which provides him with environment awareness. 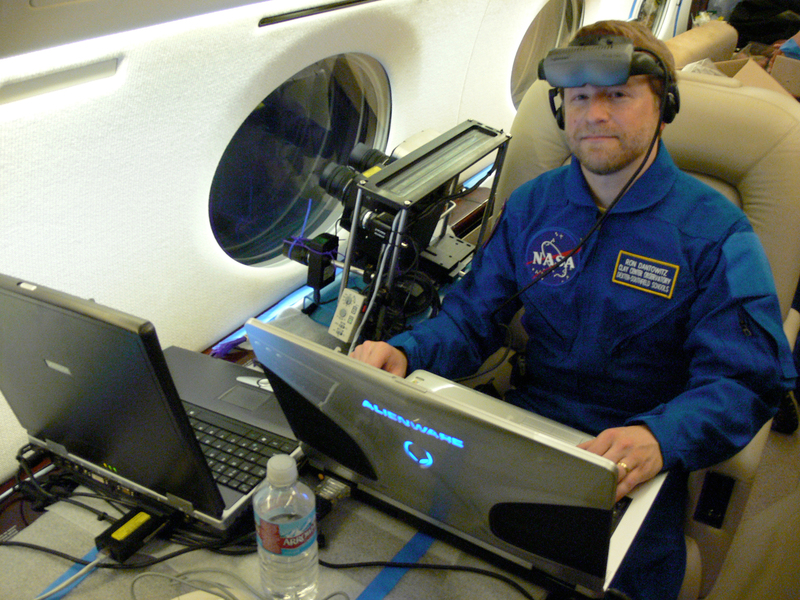 Jim will support the navigation of the Gulfstream V on behalf of the science team. He is in contact with ATV-CC. 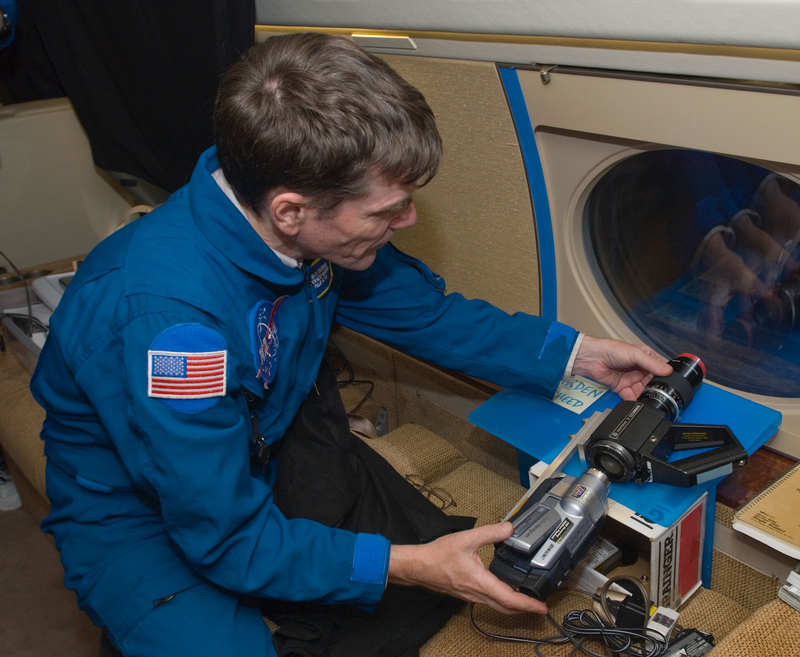 STATION 4 (above couch): NASA Ames Research Center's videographer Eric James will obtain a general record of the reentry with a hand-held HDV camcorder and digital still cameras for public outreach purposes. These observations are coordinated with the NASA and ESA public affairs offices. 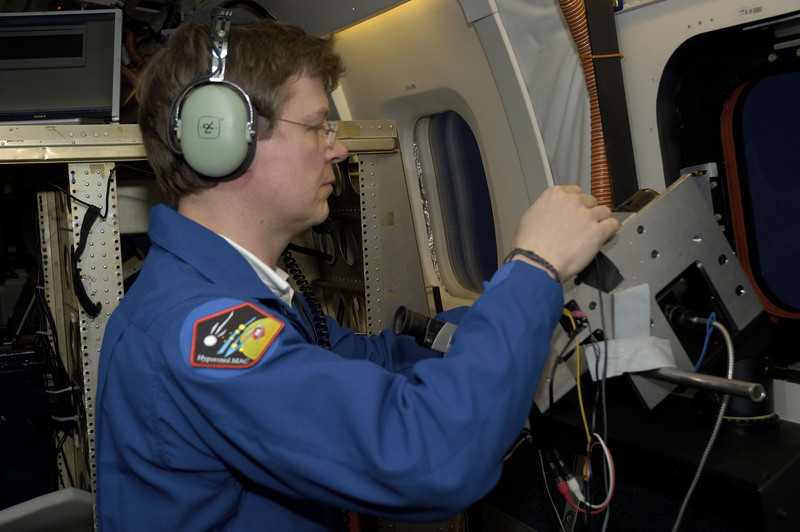 STATION 5 (above couch): Ron Dantowitz, director of Clay Center Observatory at the Dexter and Southfield Schools, and a veteran of Ursid and Quadrantid MAC missions on the Gulfstream V, will deploy an InGaAs camera for low-resolution near-IR spectroscopy at 0.96 - 1.67 micron. Surrounding the InGaAs camera will be mounted co-aligned CCD cameras for optical spectroscopy. He will be assisted by Marek Kozubal, faculty member at Dexter and Southfield Schools. Instrument setup: The aircraft was used before in the Stardust Sample Return Capsule Reentry observing campaign. We plan to use the same instrument mounts and window and seat assembly. The windows are made of optical glass, a single pane, of various materials, including Quartz, BK7, Pyrex, and sodalime. 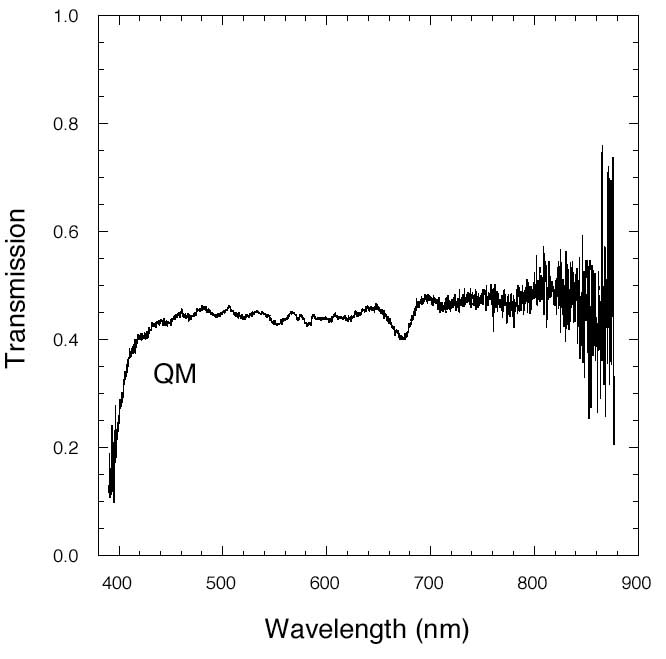 The window spectral transmission curves are known. There is AC (115 VAC) power, provided at the windows according to need. Eight horizon windows and one 60-degree window are available, as well as a zenith port and a window viewing behind. Several regular aircraft windows will be used for hand-held cameras. The camera mounts exist from the past mission, only one mount needs to be duplicated. The camera will be pointed with a co-aligned low-light-level camera hooked to a video headset display with cross hairs that is worn by the operator. A curtain will cover the camera for shielding against in-cabin lights. All instruments are mounted in the aircraft for takeoff and landing. 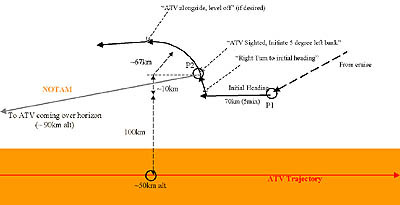 Flight path: The aircraft will be positioned near the end of the entry trajectory, at about the 50-km point, where decelleration is strong and most of the forward motion of fragments is stopped. Fragments could travel as far down as 20-30 km, but that is not much further along the entry trajectory. As a result, only a small turn is needed to be able to follow the fragments to their end point. 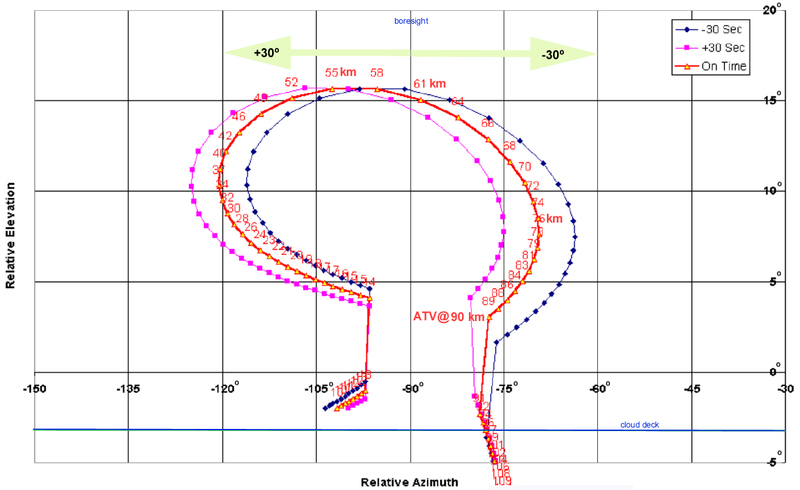 The flight procedure will be similar to that of the Gulfstream V, except that the turn will start later, will be shorter (90 degrees) and will be more shallow (5-degree turn). 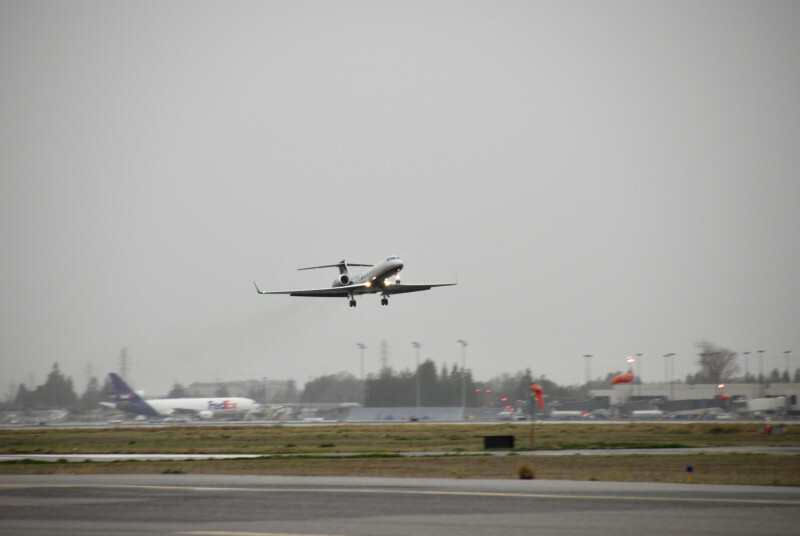 The aircraft is capable of making a smooth 5-degree turn. Aircraft communications: The aircraft is capable of standard aircraft-to-aircraft communication with the Gulfstream V at VHF frequencies. The aircraft will be about 80 km appart, which should be well within range of the communications. The aircraft also has Iridium and INMARSAT telephones for communication with the ATV control center in Toulouse. Inside the aircraft, there are several intercom stations with a public address system. The aircraft provides Irig-B signal. Total number of researchers on the DC-8: 27. Communication with ATV control center in Toulouse, and coordination of navigation B757: Emilio DePasquale of CNES. Coordination for NASA Ames Research Center: David Jordan. Stardust SRC entry observing campaign Principal Investigator Dr. Peter Jenniskens of the Carl Sagan Center of the SETI Institute will deploy a miniature Echelle spectrograph for measurements of air plasma emission lines and various paint signatures at highest possible spectral resolution in the visible range from 370 to 880 nm. The same instrument was used to study the Stardust SRC entry. He will be assisted by David Holman. Mike Koop of San Jose, with Lockheed Martin, a veteran of past observing campaigns, will operate a series of staring low-light cameras with gps time recording that provides an accurate time reference for other observers as well as astrometric and photometric data. The same cameras were used in past airborne observing campaigns. Koop is the main Point Of Contact for the gps and timing requirements for all instruments on both aircraft. NASA Ames Research Center's videographers Jesse Carpenter and Bill Moede will obtain a general record of the reentry at medium/high resolution with a High Definition TV camera and a color low-light level camera for outreach purposes. These observations are coordinated with the ESA and NASA public affairs offices. The NASA Ames team will also operate a STUDIO that displays the video from several key cameras on monitors to assist in navigation and collect material for a video news release. NASA's Ed Schilling will obtain a general record of the reentry at high spatial resolution resolution with a Red One 4 Megapixel cinemagraphic camera. He will be assisted by Claire Webb of Vassar College, who will also coordinate the instrument response calibrations. Christina Giannopapa of ESA/ESTEC will use a high frame rate camera for high resolution imaging of the early and late part of the trajectory, high resolution imaging of selected fragments at close range, and study fragmentation and explosive events, and spin rate. Christina will be assisted by Bob Haberman of San Francisco, an experienced telescopic observer. She will coordinate with the Gulfstream (Hatton) for stereoscopic observations. Prof. Geoff McHarg, USAF Academy, and cadet Shannon Kranich will deploy a high framerate imager for fragmentation studies and low-resolution optical spectroscopy (400 - 800 nm) at 300 - 1000 frames/s. He will be assisted by a cadet. McHarg is a veteran of past Stardust SRC entry and Aurigid meteor shower observing campaigns. McHarg will coordinate with the Gulfstream (Stenbaek-Nielsen) for stereoscopic observations. 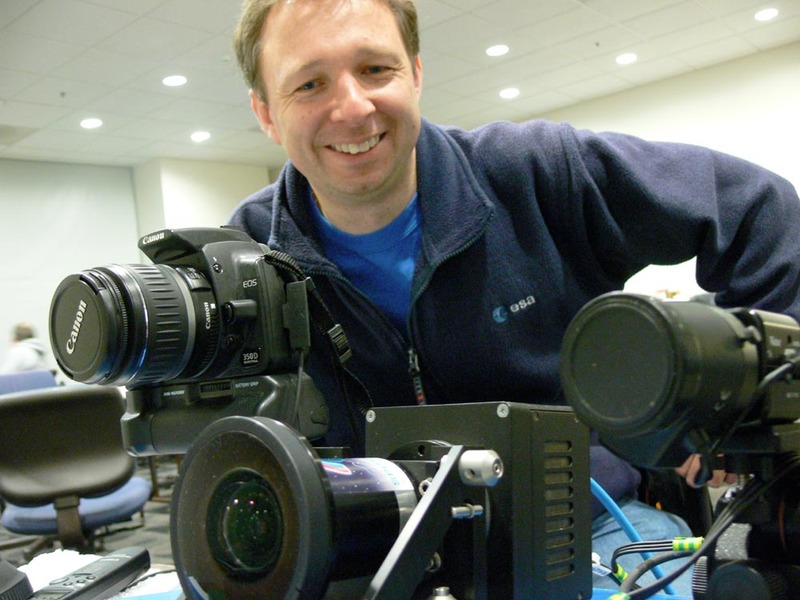 Dr. Michael Winter (Ecole Centrale Paris, Chatenay-Malabry, France) will use a Princeton Instruments intensified CCD camera with a rotating filter wheel (FROG). The filter wheel will have 6 slots in permanent rotation. Two slots are empty for pur imaging for spatial correlation, two slots contain interference filters for hydrogen emission, once centered on the line, on tilted slightly for background. The final two slots will contain interference filters of other choice, still to be determined. Ricarda Wernitz and Andreas Knapp will operate the SLIT instrument. Dr. Georg Herdrich (in the middle of this I.R.S. group photo) of the University of Stuttgart, who also participated in the Stardust SRC entry, leads the team that builds up the SLIT experiment for the ATV observation mission. Dr. Stefan Loehle (to his right) is setting up the experiment to collect the light of ATV into an optical fiber and feed a spectrograph (3 different gratings possible) to measure the near-UV emissions during breakup at high spectral resolution. The setup has been improved in order to measure with an intensified CCD camera (512x512 pixel in 19x19�m, 200 - 900 nm, 14 bit dynamic range at 1MHz or 16 bit at 100 kHz). Christoph Eichhorn (third from the left) is involved in the calculation of the spectra and Dr. Michael Graesslin (on the right) does mission analysis in order to predict the descent for better camera setup. They expect to measure the N2+ emission from shock and the CN band from fuel/oxidiser release into the wake. They hope to measure also hydrogen and fuel parts. Dr. Rick Rairden of Palo Alto, with Lockheed Martin, will focus on the near-UV part of meteor spectra, where the window is not very transparent, in order to attempt to detect CN and N2+ emission. He will use an intensified low-resolution slit-less spectrometer. He will be assisted by David Holman. Both are experienced observers in past meteor shower campaigns. Rairden deployed the same instrument for Stardust. UK citizen Professor Mike Taylor of Utah State University at Logan will deploy an InGaAs camera equipped with a grism to measure blackbody radiation and detect carbon atom line emsisions in the 960 to 1080 nm range at high resolution. He will have a co-aligned Xybion camera for pointing. He will be assisted by PhD student Jonathan Snively who will deploy a second InGaAs camera for low-resolution spectroscopy at 960 -1670 nm. He will also have a co-aligned Xybion camera for pointing. Two color 3-CCD camcorders will observe in staring mode. 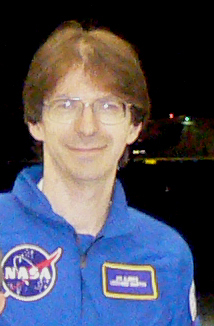 Taylor deployed the same instrument for the Stardust entry, when he detected carbon atom line emission, and participated in past Leonid MAC meteor shower missions. Dr. Detlef Koschny of the ESA/RSSD Meteor Research Group leads an effort to field the SPOSH wide angle CCD camera, which was successfully flown during the Quadrantid MAC mission. On the DC-8, the camera will be operated by Jonathan Mc Auliffe. He will be assisted by Antoine Bavandi, both of ESA/ESTEC. 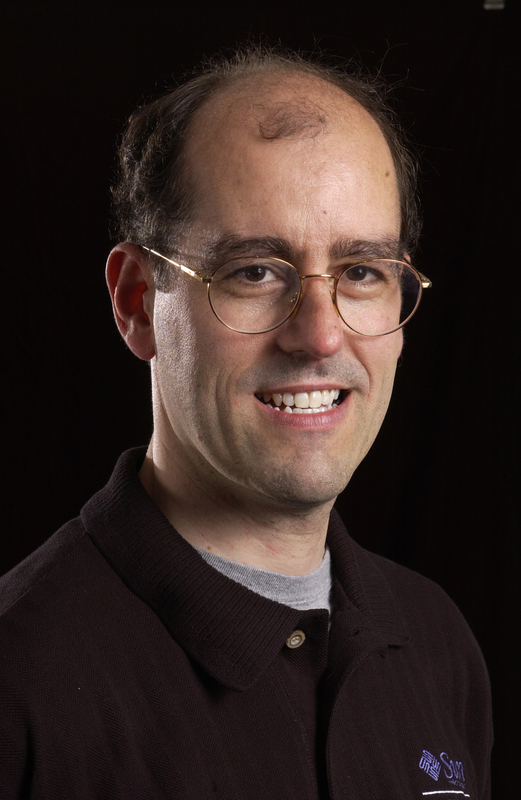 Dr. Mike Wilson of UC San Francisco will deploy a slit-less cooled CCD spectrograph. This instrument was also used during the Stardust SRC entry, when it was mounted in a staring mode. 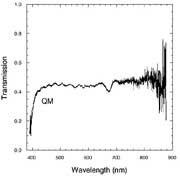 The instrument is capable of spectroscopy at sub-nm resolution, but only for a small spectral band. 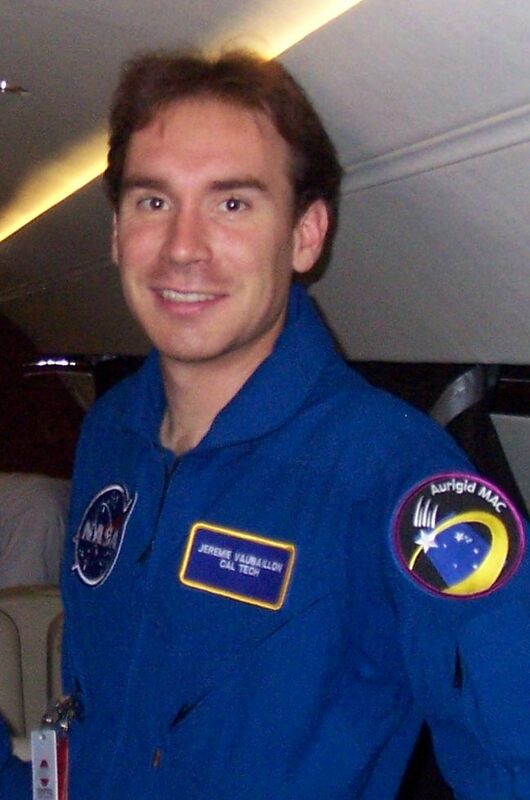 The instrument will be operated by Michael Borden of the NASA Ames Exploration Academy. 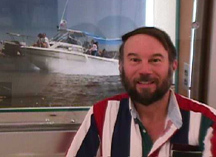 Borden will be assisted by David Sliski of Clay Center Observatory, who will coordinate the CCD observations with the team of Dantowitz/Kozubal on the GV. Jeremie Vaubaillon of Paris Observatory, France, and of Caltech will photograph the reentry on large pixel format digital images, following earlier Aurigid and Quadrantid airborne observations that resulted in two "Astronomy Pictures of the Day"! Vaubaillon will team with UK citizen Julian Nott (picture to the right), who will deploy a wide-field imaging spectrograph based on CMOS digital imaging technology, which was successfully flown during the Quadrantid MAC mission. While other imagers will tend to follow the brighter fragments, Chris Kitting and Louis Jacome of the Cal State University - East Bay at Hayward, CA, will study the small trailing fragments in later stages of the fragmentation train for dynamical studies. For that purpose, they will use two digital still cameras, a Nikon D700 (ISO 25600) equipped with a 800 mm lens (2.5 deg fov) and a Nikon D300 (ISO 3200, 5 deg fov) equipped with a 200 mm lens, each trained to ATV by means of a co-aligned Generation III intensifier (video of which recorded on HDV, 5 deg fov). They will work behind two of the normal DC-8 windows.